Visited this fabulous restaurant on Thursday 26/10/2017. We spoke no German and they spoke no English but by trial and error, pointing at pictures (and lots of laughs) we managed to order three of the best restaurant meals we have ever had on holiday. The service was exceptional, the food, wine and beer were magnificent and we had a great after a long day traveling. 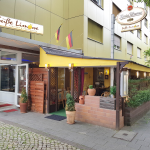 I would recommend this restaurant to anyone who visits Frankfurt and is in need of great food and a great night out.